Whiffle Board © 1931 Automatic Industries. Released in June 1931, Whiffle Board is the very first 'Pinball Machine'. Arthur Paulin a carpenter, was cleaning out his old barn Christmas time 1930, when he came across an old dusty borad with carved out holes and about 30 nail in it. It looked as if it was about 50 years old. He looked at this board for a few days and played around with it until he came up with what we now know as the 'Whiffle Board'. It was durning the Great Depression when Youngstown was in the midst of economic disaster due primarily to the closing of local still mills. Money was so tight for Arthur Paulin he decided to make this board game up for his daughter Lois Paulin as a Christmas gift. His daughter loved it so much that she invited her friends to come over and play this fun board game. Well, next thing you know there was a line all the way around the house, kids waiting to play this board game! A neighbor of Paulin's came over and told him he thought he had something big here! Paulin took the board game to a friend of his, Myrl A. Park who operated a radio shop. Paulin asked Park, "If I make another one, could I sell it in your shop." Park was not optimistic about the idea. Park said, "You should put a coin device on it, let them pay to play." Paulin like that idea, and took the board game to another friend Earl W. Froom. Froom was an electrical salesman, between the two men they came up with a coin device. Paulin, Froom, and Park made a number of experiments with the board which they dubbed as "Old Jenny". Finally they decided they had it perfected. 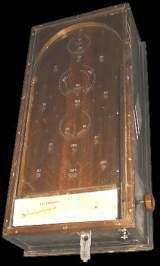 Encased with a glass top, the board had a sloping playfield, a sliding panel to drop the balls in at the start of the game, and a spring plunger to shoot the balls. The idea was to put a nickel in the coin device and that would entitle you to ten (10) balls, nine (9) white marbles, plus a red one which counted double in points. You would "shoot" to one end of the board and then the balls rolled down the board again and were deflected into various holes by nails in the board. The three men put the board game in a local General Store, and after one hour counted the money from the coin device - $2.60! The men couldn't believe it! Paulin said, "Let's build ten of these." On January 28th, 1931 the three men went into partnership. Arthur Paulin was President, and was in charge of construction and manufacture with 1/3 partnership. Earl Froom was Vice President and in charge of sales also with 1/3 partnership. Myrl Park came to assist Paulin and Froom with 1/6 partnership and another man William Howell who was in charge of all records (secretary) came in as 1/6 partnership. The company was born! They called it Automatic Industries. All four men signed a joint note for $300.00 at the Youngstown Bank, the proceeds of which will be the working capital to be expended for material and stock in trade of said company. The men rented a second floor of a building. But soon grew out of it! They decided to rent a house, and again grew out of that. They were making so much money Froom said, "We've got to pinch ourselves every once in a while to figure out whether we are dreaming." The men decided to build there own building because the orders were coming in from everywhere. Automatic Industries was shipping these Whiffle Boards to every state in the union. They sold territory rights to dozens of people all over the country. Some of these people were the most prominent of men in the country. The company would book orders averaging 2000 boards a month. Within a few years, they had passed the $250,000 mark for contracted Whiffle Board games! At that time, the company employed 53 men in the shop, 11 men and 2 ladies to do the office work. Arthur Paulin said, "I love what I do, but what makes my heart feel good is that I am able to give 66 people jobs during the depression!" Bad times ahead - People and there mothers got on the bandwagon and tried to recreate the Whiffle Board. A Chicago game manufacturers began producing copies of the game, and that the 'generic name' for these machines evetually became 'Pinball games'. A company in North Carolina actually started coping WHIFFLE, and went so far as to put Automatic Industries on them. It got so bad that racketeers got involved with the games business and that they would often smash up other operator's games on location and put their own games in their place. Froom said, "The problem got so bad that many places tried to pass laws banning pinball games which often resulted in court decisions against the games business. Then came the court battles - Paulin, Froom, and Park went to court to try to stop others from infringing on Automatic Industries patents. The court battle lasted for many years! In 1937 a Feder Judge ruled that their patents were ONLY improvements' and not an invention", a bitter defeat for the men after all those years. It is to be believed that Earl W. Froom was the inventor of the Wiffle Board. He was not! He created the coin device for the Wiffle Board, and a partner of Automatic Industries. It was reported to the Paulin family that after Paulin's death in 1947, Earl Froom claimed that he was the inventor.